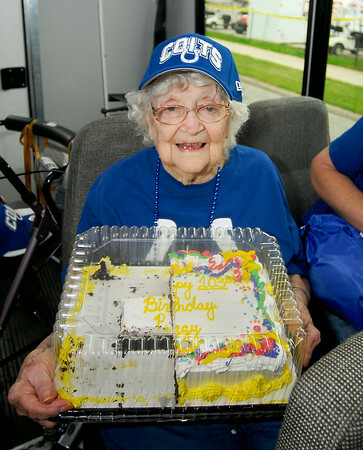 Peggy Dollens celebrated her 103rd birthday Tuesday out at Colts Camp where they gave her a birthday cake, football, and hat. The team is also going to make Peggy their "12th Man" for their home game against Cincinnati October 19th and bring her out on the field and introduce her. Dollens is a resident of Bethany Pointe Health Campus who takes a group of residents each year to Colts Camp.